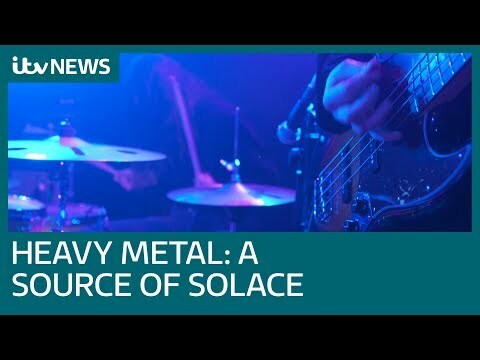 It may seem unlikely, given its themes of death, but heavy metal is a genre providing an escape to peace for so many victims of war around the world. Now fans of the music, including artists from Syria, have traveled to London for the first ever World Metal Congress. The genre was first created over half-a-century-old ago and many credit Ozzy Osbourne’s Birmingham based band Black Sabbath as its pioneers. World Metal Congress was a two-day celebration of heavy metal and its global appeal. With film premieres, live music, and lively debate featuring the great and good of the heavy metal world. WMC was and still is all about bringing the global heavy metal community together – from India to South Africa to Singapore to Syria and beyond. Some of the black-clad metal devotees attending the congress are refugees who say the heavy sound of death metal helped them as war victims, find solace when all else they could hear was the sound of war in their home countries. “Many people in Syria connect metal to suicide – I think it prevented me from doing such things because it gave me strength at the worst times,” says Syrian Monzer Darwish. Jake Shuker, who is part of a band that was originally formed in Damascus, says that in a time of war, the music genre offered him peace. “When you’re hearing all these sounds, bombs, mortars, you always see blood, people getting killed,” he said. Dr Lina Khatib, who is head of the Middle-East programme at the think tank Chatham House, says heavy metal came to her at a time when “I was a teenager growing up in Lebanon and seeking somewhere to belong”. Khatib added: “It spoke to me as a music that commented on war, on conflict and oppression. Motley Crue Cover Madonna And It's Ridiculous!